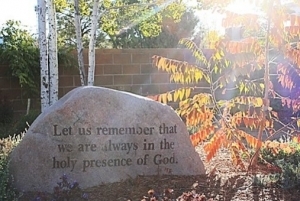 Intention: For God’s blessing on the new school year and our Lasallian mission of accompanying students in the sacred and urgent work of building the Kingdom of God. Jesus Christ, speaking to his apostles, told them that he gave an example to them that they might do as he himself had done. He also wanted his disciples to accompany him at all the conversions he brought about, so that seeing how he acted, they could, in all they would have to do to win souls to God, be guided and formed by his conduct. This is also what you must do, since Jesus Christ has chosen you among so many others to be his cooperators in the salvation of souls. In reading the Gospel you must study the manner and the means that he used to lead his disciples to practice the truths of the Gospel. Eternal Father, Jesus taught us to see and to accept your truth, both the comforting reassurances and the hard realities. Lead us away from wanting life to be free of sacrifice and from finding reasons to avoid doing your will. Help us to realize that your come to us through the challenges of the day and the needs of others. May we open our eyes and hearts so that we can learn from life who you call us to be and what you call us to do. We ask this of you who lives and reigns with your Son and the Holy Spirit, one God forever and ever. Amen.